Getting stitched up by Dr. Robot may one day be reality. Scientists have created a robotic system that did just that in living animals without a real doctor pulling the strings. Much like engineers are designing self-driving cars, the medical research is part of a move toward autonomous surgical robots. They can remove the surgeon's hands from certain tasks. Instead, a machine might perform those tasks all by itself. No, doctors wouldn't leave the bedside. They're supposed to supervise. Plus, they'd handle the rest of the surgery. Nor is the device ready for operating rooms. Small tests have been performed using pigs. The robotic arm performed at least as well, and in some cases a bit better, as some competing surgeons in stitching together intestinal tissue. Researchers reported this in the journal Science Translational Medicine. "The purpose wasn't to replace surgeons," said Dr. Peter C. W. Kim of Children's National Health System in Washington. Kim is a pediatric surgeon who led the project. "If you have an intelligent tool that works with a surgeon, can it improve the outcome? That's what we have done." If you've heard about machines like the popular Da Vinci system, you might think robots already are operating. Not really. Today many hospitals offer robot-assisted surgery. Surgeons use the machinery as tools that they manually control. They are used typically to operate through tiny openings in the body. But robot-assisted surgery has been controversial. Some studies have shown it can bring higher costs without better outcomes. So why the push for next-generation autonomous robots? Proponents think there are cases where a machine's precision may outperform a human hand. The latest project is "the first baby step toward true autonomy." That is according to Dr. Umamaheswar Duvvuri of the University of Pittsburgh Medical Center. He is a head and neck surgeon and robotic specialist. He wasn't involved with the new work. But don't expect to see doctors ever leave entire operations in a robot's digits, he cautioned. It's designed to do one specific task, stitch up tissue. The machine is a lot like the automation trend in other industries. Robot arms do the welding and painting in most U.S. car assembly lines, for example. They can find inventory in warehouses. From the driver's perspective, many cars now are able to warn drivers when they're too close to the car in front, or take control and apply the brakes to prevent a crash. The new STAR system stands for Smart Tissue Autonomous Robot. It works sort of like a programmable sewing machine. 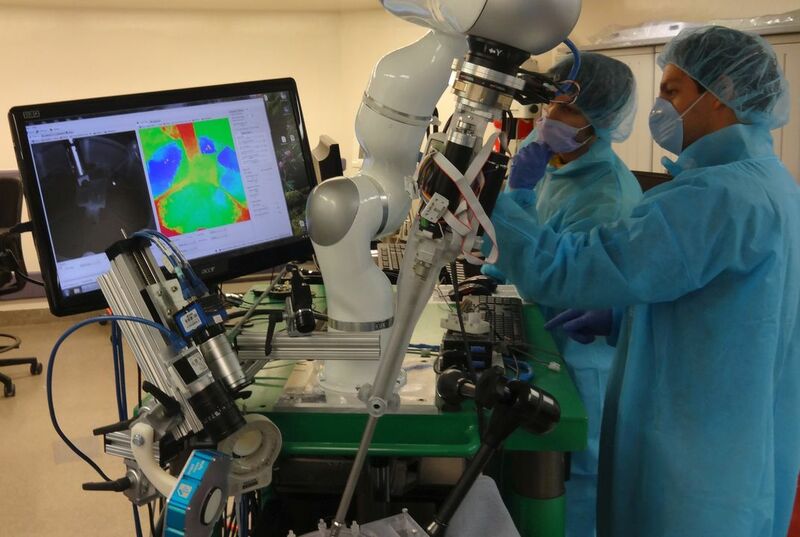 Kim's team at Children's Sheikh Zayed Institute for Pediatric Surgical Innovation took a standard robotic arm and equipped it with suturing equipment plus smart imaging technologies to let it track moving tissue in 3-D and with an equivalent of night vision. They added sensors, too. Those helped guide each stitch and tell how tightly to pull. The surgeon places fluorescent markers on the tissue that needs stitching. Then the robot takes aim as doctors keep watch. Now the test: Could the STAR reconnect tubular pieces of intestinal tissue from pigs, sort of like two ends of a garden hose? Any soft-tissue surgeries are tricky for machinery because those tissues move out of place so easily. And the stitches in these connections must be placed precisely to avoid leaks or blockages. It is a challenge even for experts. Using pieces of pig bowel outside of the animals' bodies as well as in five living but sedated pigs, the researchers tested the STAR robot against open surgery, minimally invasive surgery and robot-assisted surgery. By some measures - the consistency of stitches and their strength to avoid leaks - "we surpassed the surgeons," said Children's engineer Ryan Decker. The STAR approach wasn't perfect. The STAR had to reposition fewer stitches than the surgeons performing minimally invasive or robot-assisted suturing. But in the living animals, the robot took much longer. It also made a few suturing mistakes while the surgeon sewing by hand made none. Kim's team has filed patents on the system. He said the robot can be sped up. He hopes to begin human studies in two or three years. What are the advantages of robotic surgeons? I wouldn't let a machine operate on me, I feel like something could go wrong. What if the machine slipped and cut a very important part in my body, it wouldn't know how to fix it. I think that this is very interesting because I'm surprised that people have designed a robot to operate on you and that shows how much technology has grown. In my opinion i would not let a robot operate on me because what if it breaks down or something goes wrong and you could get hurt. Maybe one day this invention will work and people won't have to work so much but i think its a little to early to operate on people. Cant wait to hear more about it in the future! The advantages of robot surgeons is that, " Today many hospitals offer robot-assisted surgery. Surgeons use the machinery as tools that they manually control. They are used typically to operate through tiny openings in the body. But robot-assisted surgery has been controversial. Some studies have shown it can bring higher costs without better outcomes." So if robot surgeons do proceed in an operating room then there will be better results for the patients leaving them with a better recovery. I think that it is very creative that people have thought of using robots as surgeons because this can lead to a benefited patient and hospital because of the robot's help. there is no telling if the machine will break when it is operateing on me.i will never let a machine work on me. The advantages of robotic surgeons is that they can get the job done quicker and there would not have to be a lot of surgeons. It takes too many risks and the only real advantage of that machine is it saves human lives. I think that the advantages of the robotic surgeons save more time in human hour and it makes knowledge advance quickly. It is a bad thing to have a robot operate on you because you'll never know when the robot will do somehting bad or will affect you. 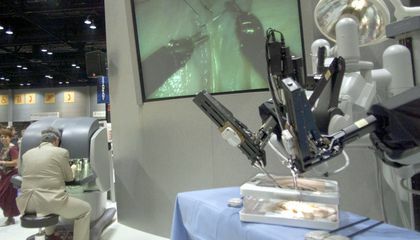 This robot could work in certain situations, but other situations could be done by a normal surgeon. The robot can be used for repairing small tissue that surgeons can't reach. The advantages of robotic surgeons is that they are able to do great operations for animals. But what if the robot breaks down in the middle of the surgery in a human, they could put the human in risk and maybe having a 50/50 chance of living.